The Pramac GSW series are second to none when it comes to stationary generator power for your business. Renowned for exceptional reliability and durability in all matter of environments, these units are ideal for commercial building supply, industrial equipment operation, large event power requirements and back up/ standby purposes. 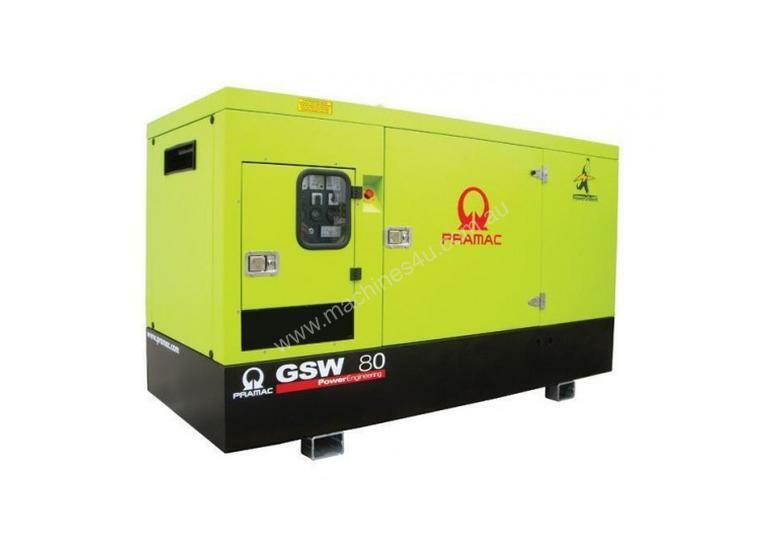 The Pramac GSW80 model produces 83kVA of three phase power using the world leading Perkins Diesel engine. The Italian manufactured alternator includes a digital voltage controller which delivers voltage accuracy to within 1%. A 209 litre fuel tank provides 16 hours of uninterrupted running time at 75% load. The genset is enclosed within a full weatherproof canopy which is realised with zinced steel on the exterior to protect the unit from corrosion. The inner lining of the enclosure is rock wool material to soundproof the generator during operation. Lockable lateral access doors and detachable panels make for easy access for generator maintenance. The control panel (also lockable) gives full operation and monitoring though analogue and digital instrumentation. Built to last, the base of the unit is fully welded steel with forklift pockets and anti-vibration mounts. The unit comes fully pre-delivered and tested in Australia and is backed by a national service network.